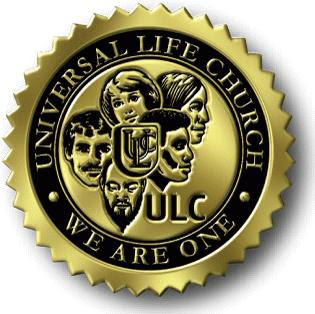 After many years of dissatisfaction with organized religion-- specifically the ability to be ordained and continue to be a practicing rug-muncher-- I have treated myself to the basic ordination package at the Universal Life Church. They are the original fly-by-night outfit founded in the late fifties. It's the one all the stars go to. Yes, I will be among the ranks of people like Johnny Depp who have the legal power to marry people and park in a hospital zone. Check out the drop down box of "Titles" you can choose from for yourself when you buy the Complete Ministry Package. I wonder if my pastor at my "real" church will be offended??? Here's a link to the Universal Life Church. "if you wish to join us to show your support or appreciation you can become a Registered Member. For a one-time registration fee of two hundred dollars in United States currency, you will receive an embossed crimson card declaring you a member of the Church of Satan... If you wish to take a more active role in the Church of Satan, we require that you become an Active Member. This requires that you fill out an Active Membership Application, indicating your more serious interest in our organization. Once you have been accepted as an Active Member, the Church of Satan acknowledges that your presentation of yourself fits our definition of “Satanist.” We are currently working through an extensive backlog of Active Applications, so it may take about a year before you will receive the response.."
I can't wait a year! And that's just to become a satanist! I want to be a priest right now, like marilyn manson! The application form is really funny, though. These guys are such nerds.